The Arab League has condemned the Republican US presidential contender, Newt Gingrich, for calling Palestinians an "invented" people and "terrorists". Mohammed Sobeih, who handles Palestinian affairs for the regional organisation, said the claims were racist and a cheap stunt to get votes. 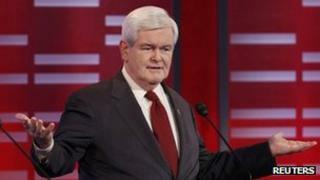 Mr Gingrich made the comments in a television interview on Friday and in a candidates' debate on Saturday. Israel's government has said the claims are a matter of internal US politics. However, Prime Minister Benjamin Netanyahu, who leads a right-wing coalition government, has recognised the Palestinian people. Mr Gingrich, the frontrunner for the Republican nomination and a former speaker of the US House of Representatives, first set out his position on the Palestinian people in an interview with the Jewish Channel. "Remember there was no Palestine as a state. It was part of the Ottoman empire," he said. "I think that we've had an invented Palestinian people who are in fact Arabs and who were historically part of the Arab community. And they had a chance to go many places, and for a variety of political reasons we have sustained this war against Israel now since the 1940s, and it's tragic," he added. He also said President Barack Obama's Middle East policy was "out of touch", and the Palestinian Authority, which governs the West Bank, and Hamas, which governs Gaza, had "an enormous desire to destroy Israel". Mr Obama has sought to broker a peace deal between Israel and the Palestinian Authority, and said there should be a Palestinian state with borders based on those prevailing before the 1967 Arab-Israeli war, adjusted to account for Jewish settlements in the West Bank. Hamas is considered a terrorist group by the US, EU and Israel. Then in a televised debate on Saturday, Mr Gingrich defended his claim that the Palestinians were an "invented" people. "Is what I said factually true? Yes," he said. "Somebody ought to have the courage to tell the truth. These people are terrorists." Mr Gingrich later sought to clarify his position, saying he supported the creation of a Palestinian state as part of a negotiated settlement. But the Palestinian Authority Prime Minister, Salam Fayyad, said Mr Gingrich's comments "constituted a totally unacceptable distortion of historical truth", and described them as "vulgar, hurtful and ridiculous". In Israel, Mr Fayyad added, "even the most extremist settlers don't dare to speak in such a ridiculous manner". And on Monday, Mohammed Sobeih said the Arab League believed the claims were "irresponsible and dangerous". "If an Arab or Palestinian official said a racist comment that was one-millionth of what this US candidate said, the world would have been in continuous uproar," he said. "If these comments were made for political gains, then this is an even bigger disaster. But it appears that this is a cheap attempt to get more votes in an election. And to get this small number of votes, this person sold America's interests by denying international law and democratic principles," Mr Sobeih added.